To calibrate a CDN an adaptor, a fastening angle and 50 Ω / 150 Ω adaptor are required. Fastening angle and 50 Ω / 150 Ω adaptor should be ordered for the first CDN. For each following CDN only the specific adaptor has to be ordered. The EUT shall be placed on an isolating support, 0.1 m above the ground reference plane. For table-top equipment, the ground reference plane may be placed on a table. On all cables to be tested, coupling and decoupling devices shall be inserted. The coupling and decoupling devices shall be placed on the ground reference plane, making direct contact with it at about 0.1 – 0.3 m from the EUT. The cables between the coupling and decoupling devices and the EUT shall be as short as possible and shall never be bundled or wrapped. The height above the ground reference plane shall be between 30 and 50mm (where possible). The 6dB attenuator shall be placed to the coupling and decoupling device as near as possible. The test shall be performed with the test generator connected to each of the CDNs in turn while the other non-exited RF-input ports of the CDNs are terminated by a 50 Ω load resistor. 1. The test generator (RF-out) shall be connected to the RF-input port of the coupling device via the 6dB-attenuator. 2. The EUT port of the coupling device shall be connected in common-mode through the 150 Ω to 50 Ω adaptor to the RF-Voltmeters (calibration). 3. The AE-port shall be loaded in common-mode with a 150 Ω to 50 Ω adaptor, terminated with 50 Ω. With direct injection to screened cable (CDN S-types), the 150 Ω load at the AE-port is not required as the screen will be connected to the ground reference plane at the AE-port side. Although the 150 Ω load at the AE-port is mandatory with CDN T-, AF- and M-types calibration data are identical with the AE-port open or short. This is because a capacitor is connected to ground at the AEport side, which leads to a RF-short-circuit similar to the CDN S-types. 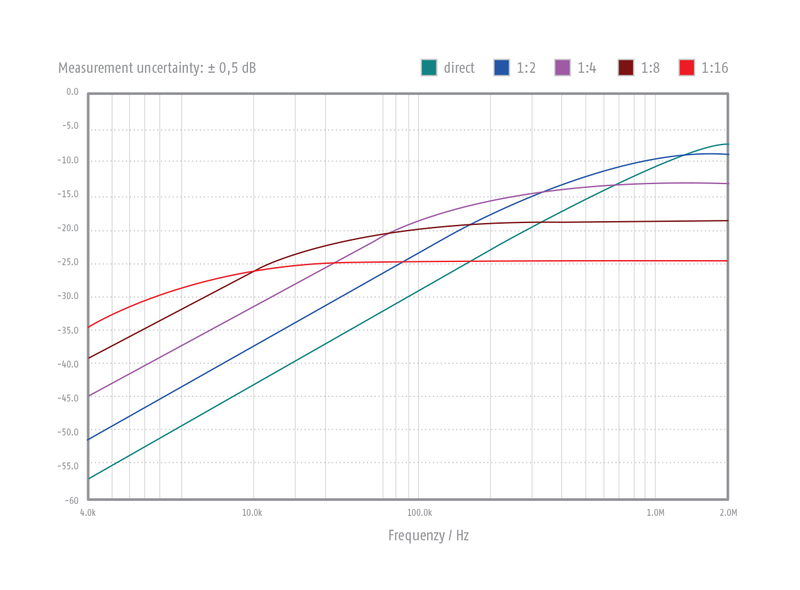 This means that even with CDN M-, AF- and T-types the 150 Ω load at the AE-port is not required. According to IEC/EN 61000-4-6 the preferred coupling and decoupling devices are the CDNs, for reasons of test reproducibility and protection of the AE. However, if they are not suitable or available, clamp injection should be used. Often, clamp injection needs to be applied to multi-pair balanced cables because suitable CDNs might not be available. The EM clamp establishes both capacitive and inductive coupling to the cable connected to the EUT. The EM clamp (in contrast to the conventional current injection clamp) has a directivity ≥10 dB, above 10 MHz, so that a defined impedance between the common-mode point of the AE and the ground reference plane is no longer required. Above 10 MHz, the behavior of the EM clamp is similar to that of a CDN. 0.15 MHz – 100 MHz 100W, 15 min. 100W, 15 min. 100 MHz – 230 MHz 100W, 5 min. 100W, 5 min. 230 MHz – 1000 MHz 50W, 3 min. 50W, 3 min. 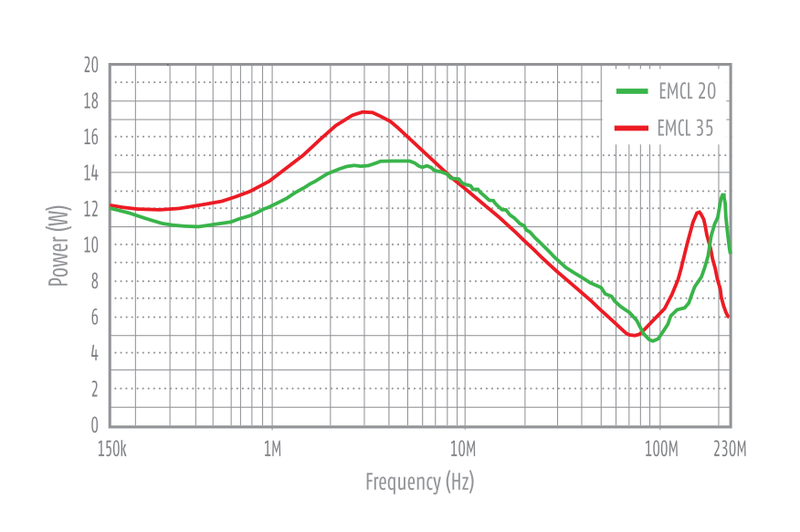 Measured amplifier output power to obtain a rest level of 10 V. 6 dB attenuator and 80% amplitude modulation depth are taken into account. The Bulk Current Injection Probe is used to inject RF-current into cables of electrical equipment to test the susceptibility against radiated electromagnetic energy. It was designed to meet the specifications of ISO 11452-4:2005 and IEC 61000-4-6 standards for automotive BCI testing with secondary currents of 300 mA and more. The probe can be easily clamped around test conductors and supports cable harness diameters up to 40 mm diameter. *higher input power possible for shorter duration. Control via integrated temperature sensor. Insertin loss when using the matching transformer MT-1. The selection of the ration in dependence of the frequency can be optimized by automatic software control via LAN or UB-interface. The Current Monitoring probes may be used whenever RF current measurements are required. Current measurements are made by placing a current carrying conductor within the “sensing” window of the probe and measuring the probe’s output voltage with an RF detector. Calibration of the probe permits the conversion of the voltages measured to current. Current measurements can be made over the frequency range shown in the transfer impedance curve furnished with each probe. There is virtually no loading of the circuit and the technique permits normal operation of the device under test during measurements. The MP-50 can be used for the procedure for clamp injection when the common- mode impedance requirements cannot be met given in chapter 7.4 of IEC/EN 61000-4-6 „Immunity to conducted disturbances, induced by radio frequency fields”. The MP-50 can also be used as current monitor for BCI testing as per ISO11452-4, RTCA/DO-160 section 20, MIL-STD-461 and various automotive standards. Disturbances shall not be coupled into any support instruments. This requires decoupling of the lines. In many cases isolation transformers are used for decoupling. We offer a wide range from 6A/1-phase to 20A/3.phase. All isolation transformers are compliant to IEC/EN 61000-4-16. As described in IEC/EN 61000-4-16 at the frequency of the electrical power supply (either DC, 16 2/3 Hz, 50 Hz or 60 Hz) the test stimuli are applied as both continuous and short-duration disturbances. Otherwise, over the frequency range 15 Hz to 150 kHz, the test stimuli are applied as continuous disturbances only. The normal duration for short duration disturbances at the electricity supply frequency is one second. The M2345/32-16 is a multifunctional coupling network for test levels up to ±300 V in connection with test generators MTS-800, PSG-300 and PSG-E300. In this case the M2345/32-16 is remote controlled via the application software of the test generators. Otherwise the coupling network may be front panel operated as a stand-alone device. The M2345/32-16 operates as a M2, M3, M4 or M5 coupling network. The selection can be made by a rotary switch. The coupling capacitor is shorted out for the DC tests by a push-button. For automated test you may toggle between AC and DC tests via the USB-port.